Disgusting as it was for the most part, the debate on offerings and piety that ragged through the internet last year did have one positive effect for me: it made me wonder about how can I improve my personal devotion to the Gods. For several years, I’ve been offering mostly incense and basic prayers in my monthly tributes to Janus, Juno, Jupiter, Minerva, Mercury, Ingui-Frey, my Ancestors and my Penates. It’s not that I didn’t want to offer more, namely libations, wheat and cakes, it’s just that I was always confronted with the problem of what to do with food offerings. For the most part, burning them isn’t a practical option in a modern house, where electrical appliances virtually fill in all of the heating, cooking and lighting needs, leaving fire with a residual presence at best. And in order to burn food, especially several portions of it – ’cause libations to Janus and Vesta are always needed – you need more than a candle flame. Potted plants have their limits – it’s not a one-time thing – and while city parks are a solution, it’s also more of a last resort than an ideal solution for more frequent offerings. However, recently I’ve been spending most of my time at the family house, which has a fireplace, so I made the New Year decision of upgrading my monthly offerings since, at least for the time being, it’s easier for me to burn food. It’s just a question of being organized enough to always have enough wood for at least five times a month. This will naturally be easier during Spring and Summer, since I can use my bike rides to frequently stop in a local woodland and pick up what I need; during the rainy season, I’ll have to make do with stored extras from Summer and twigs picked up in city parks. Then it’s just a matter of lighting up a small fire, make a wine libation to Janus and a milk one to Vesta and burn whatever food offerings I make to the god of the day. 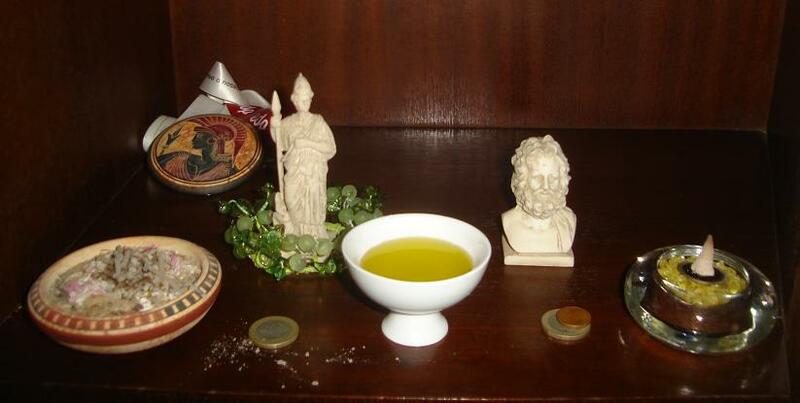 Today’s is Minerva, so in the morning, as part of my early daily salutations and prayers, I decorated Her image and offered incense and olive oil, which I later burned in the fireplace. I did the same last January 1st to Janus, Juno and Mercury (since it was also the first Wednesday of the month), to Jupiter on the 13th and to my Ancestors and housewights on both occasions, as well as on the 5th. As for Ingui-Frey, I think I’ll be using the potted plants in our balcony to pour His libation and portion of honey. This is a temporary solution until I get Him a vase of His own with flowers, a small offering stone and two miniature god poles I’ll have to carve. That too is a plan born out of my desire to improve my monthly tributes.